Marlena Newman has been married to Larry Newman for 45 years. 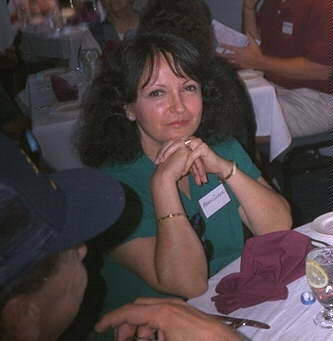 The first two of those years she spent as a Navy Wife. She spent many an hour in San Diego waiting for the Hanson to make port. Their first child, a daughter, was a navy baby. 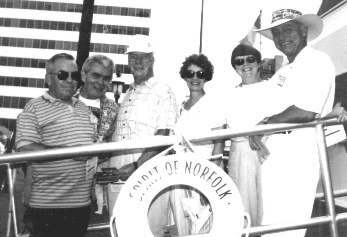 As the good ship, Spirit of Norfolk, eases its way out into the harbor, Duffy hoists one while Jack & Josie Kearcher take note of his expertise. 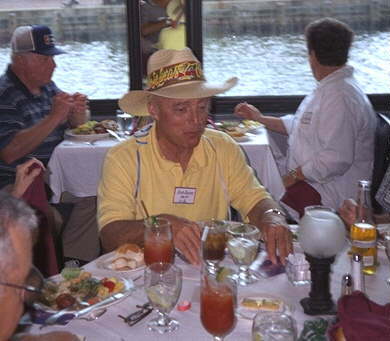 The focus of this shot is Bob Bootes in his colorful attire. Many of us knew him as Ensign Bootes, the R Division and then the Engineering Officer on the Hanson, 1956-58. 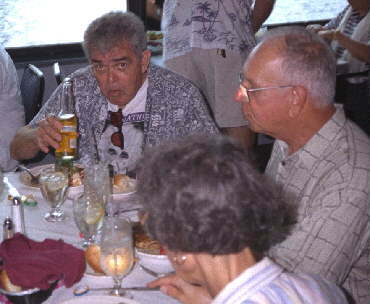 In the background directly behind Bob Bootes are Don and Gerri Wilts. 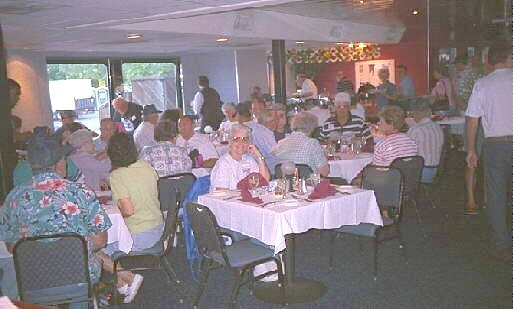 Marty Sullivan and his wife, Jackie wait for lunch to be served. Marty was ? Officer on the Hanson, 19??-?? We are grateful to Marty for his prudent action in saving the photos appearing on this web site, which bear his credit, from the trash can. The Hanson had been decommissioned and someone tossed these wonderful photos. Thanks Marty! We all owe you! That's Bill Nolan in the background. Frank is hiding under that ball cap, lower left, but Fran, his lovely wife, faces the camera boldly. Our apologies to Frank for this shot, but its all we got. 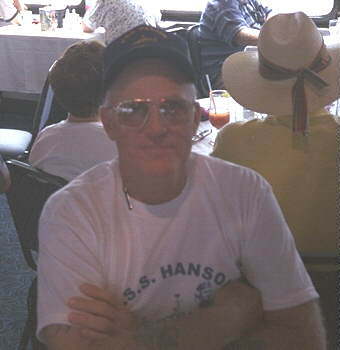 Frank was an FTG2 and served on the Hanson 1968-70. 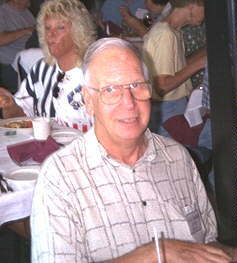 Bob Morris and his wife Carol (peeking over Vern Neuhalfen's head). Bob was a snipe. A MM2 he worked in the After Engine Room. 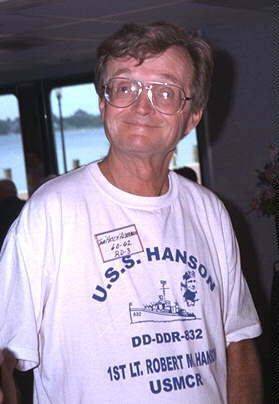 He was aboard the Hanson 1952-56. I worked with Bob for a short while before he mustered out in 1956. 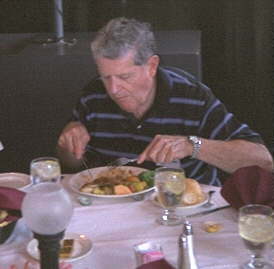 Don Shepherd MM3 worked in the After Engine Room. He was aboard the ship 1951-55. I stood watch with Don for a short while before he went home to Ohio. 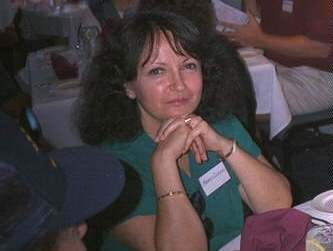 Pat Fernicola and his wife, Joan. 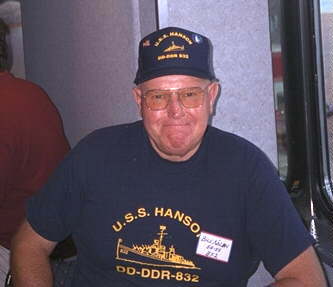 Pat was a QM3 and served aboard the Hanson 1950-53. 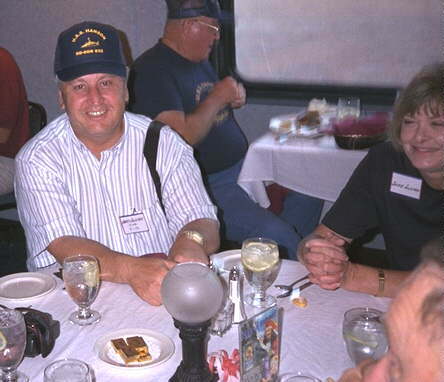 Pat rescued the Hanson's bell, which is now residing on the USS Edson DD 946, a destroyer museum in New York. We owe Pat our appreciation for this feat! A picture of the bell can be seen on this web site. 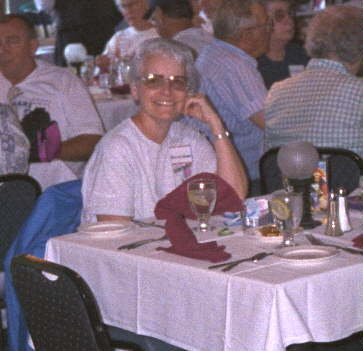 Pat also serves as a director of the Tin Can Sailor's Association. 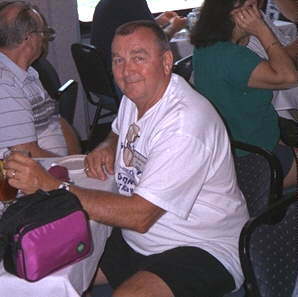 Captain Richard Fleeson was the Hanson skipper 1969-71. It was a pleasure to have him share this reunion with us. CDR Fleeson was the next to last CO. We enjoyed his brief remarks at our banquet. Dave Richards and wife Debbie. Dave was a YNSN while on the Hanson 1956-57. This is the guy who kept the liberty cards. You gotta love him! 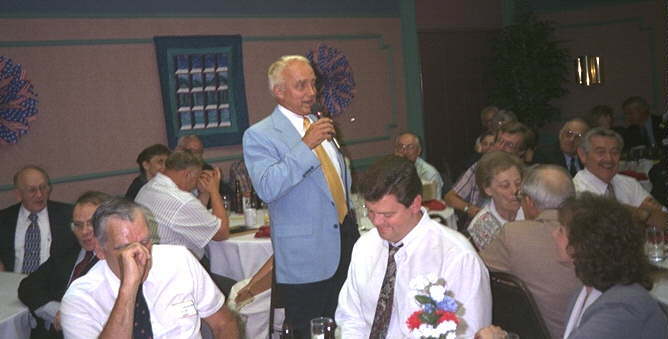 Lou DeLancey served as chairman of this year's reunion committee. Thanks, Lou, for a job well done! If you haven't written him, you must! 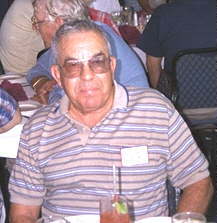 Lou was a pipefitter on the ship. DeLancey FP1 served aboard the Hanson 1956-58. He was one of the shellbacks that tormented we poor pollywogs in 1957. 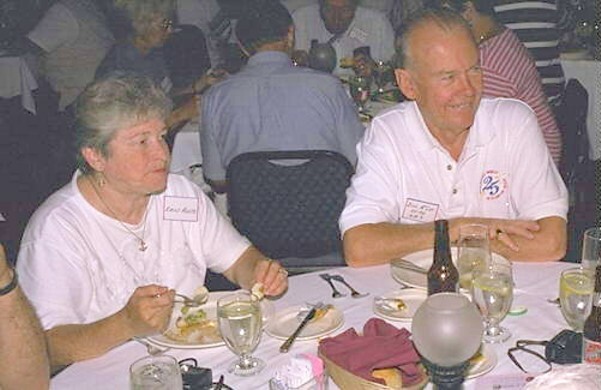 Lois Hall, Lou's friend is on his right. Tom Alderman RD3 Served on the Hanson in 1960-62. 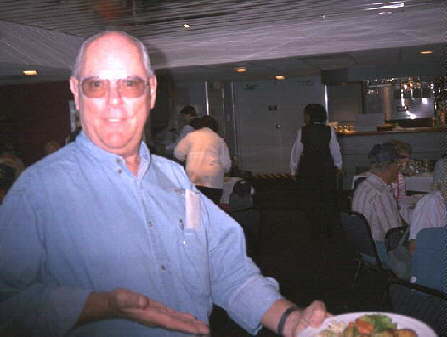 Tom is one of the first of former crew that I came across as I began building this web site. It was great meeting Tom in person at the reunion. 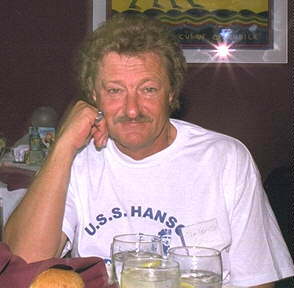 Vern Neuhalfen worked as a boiler tender on the Hanson. 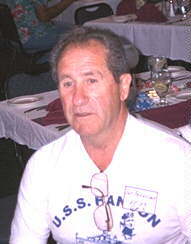 He served aboard the ship in 1951-55. Just over Vern's left shoulder is Max Winslow. Max Winslow BT2 served aboard the Hanson in 1952-56. He and boyhood buddy Bob Morris MM2, enlisted, did boot camp, and served on the Hanson together. They are still hanging out together. 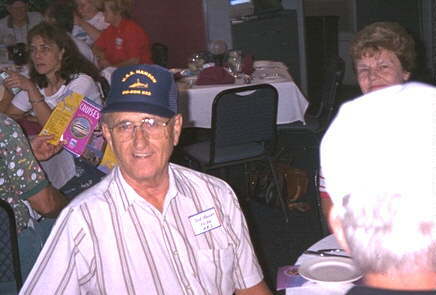 Duane Miller MM1 served aboard the Hanson in 1949-56. 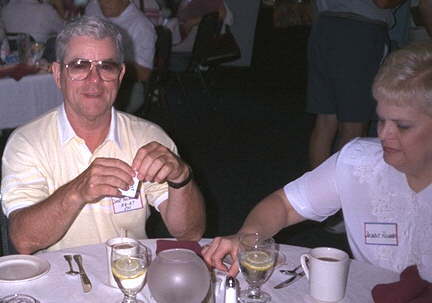 Duane and Bob Morris are married to sisters. Bob played cupid. 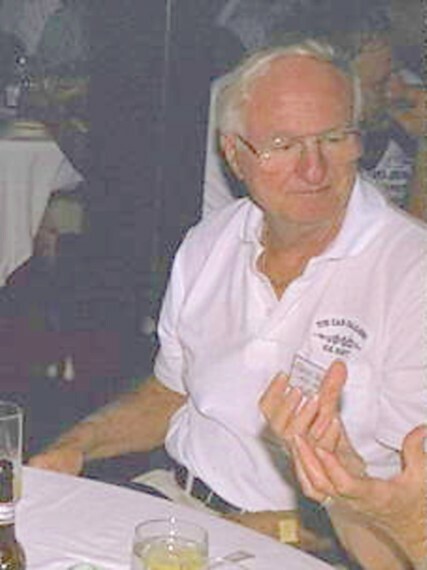 John Hurd SM3 spent the years 1955-59 as a part of the Hanson crew. Having traded e-mails with John, it was a pleasure to meet him in person at the reunion. 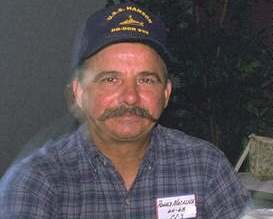 This is John Hurd's friend and shipmate. John when you see this please send me the particulars. I failed to get them at Norfolk. Thanks! 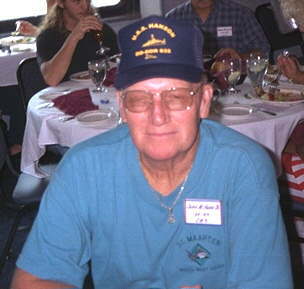 Jack Kearcher EN3 was the Chief Engineer on the Captain's gig. Jack served on the Hanson in 1957-58. You can see Jack at work in the photos of the Hanson's rescue of the downed airmen. Directly behind him is Mrs. Jim Watson. Jim a SM2, served on the Hanson 1966-70. Larry Newman and his wife, Marlena. Larry a MM1 served on the Hanson 1954-58. He began in the After Engine Room as a FN. In early '56, as a MM2, he moved to the Forward Engine Room where he made MM1 in early 1958. 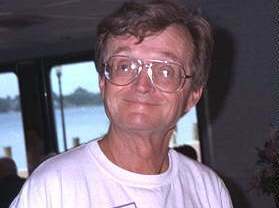 Larry is the Webmaster of this site, and proud to be a tin can sailor. 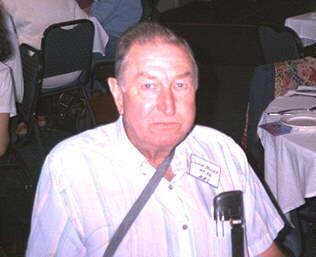 Jerry Matthews served on the Hanson in 1954-58. To his left is Mrs. Matthews. 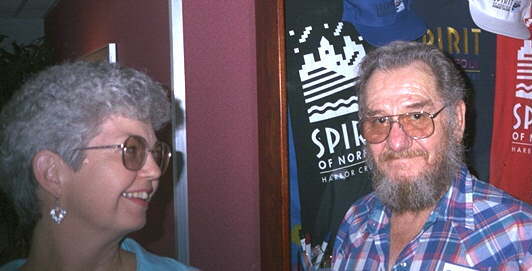 Don and Lynn Bryant. As a GMG3 Don served on the Hanson in 1967-68. Don has contributed some very interesting photos to this web site. We thank you Don for helping add meaning to the site. Wayne Jackson FP1 served on the Hanson in 1956-57. His was the daunting task of riding herd on the likes of Lou DeLancey, Rich Duffy, Don Anderson, Tony Ponce, et al. Give the man a golden crown! 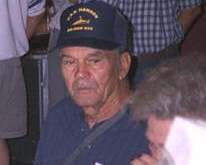 Tony Ponce DC3 was one of those who controlled the damage the rest of us did to the ship. :) Tony was on board the Hanson 1954-58. 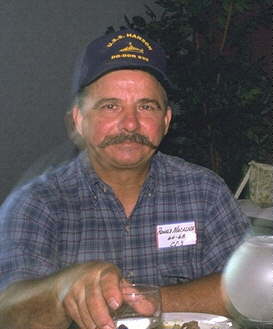 Ronald Macalusa CS3 served on the Hanson in 1964-68. 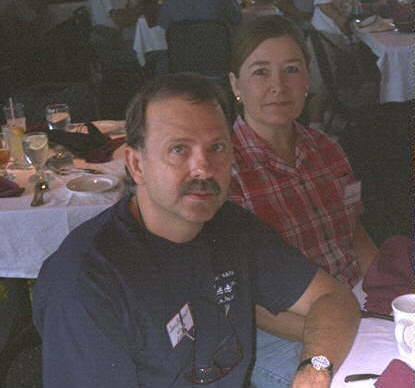 Don "Andy" Anderson and wife. Don FP3 served on the Hanson in 1956-57. He was a member of that infamous R Division gang. What should we call them...the Jackson 5? 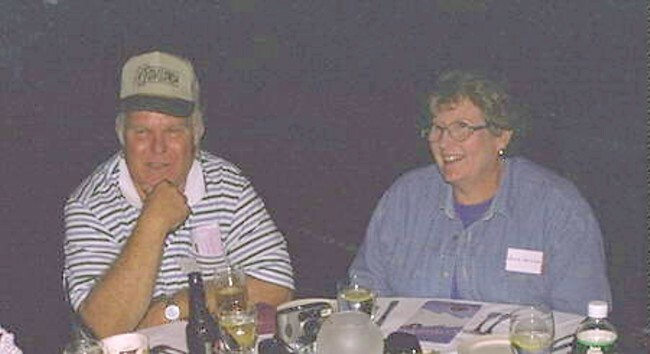 Bill McLay GM3 and wife Rita. 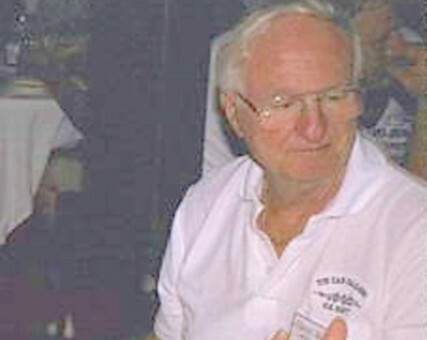 Bill is a member of the original crew, and Plankowner. He served on the Hanson in 1945-46. He also was a member of the Reunion 98 committee. Thanks, Bill for a job well done! Bill was awarded a plaque honoring his Plankowner status. Ernst Veller GM3 is one of the original crew of the Hanson, 1945-46. That makes him a Plankowner, and he's got a plaque to prove it! 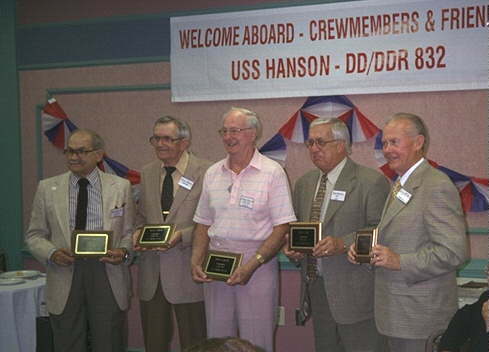 Five of the original crew of the Hanson were honored with plaques. 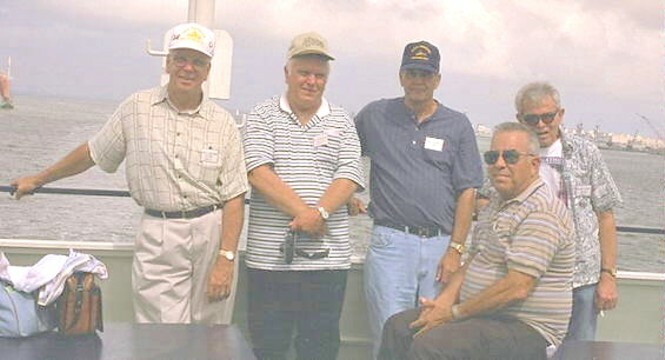 Left to right: Andy Warchol, Hollis Trunk, Ernst Veller, Paul Wassel, Bill McLay. These are Bootes buddies. This group picture is in honor of him. We are all proud to have served under Bob Bootes on the Hanson. 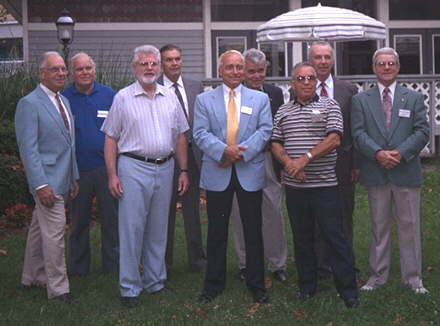 Left to right: Jack Kearcher EN3, Don Anderson FP3, Larry Newman MM1, Wayne Jackson FP1, Bob Bootes LTjg, Richard Duffy FP2, Tony Ponce DC3, Lou DeLancey FP1, Dave Richards YNSN. 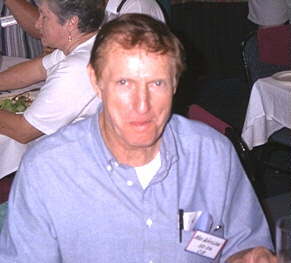 Jim Watson SM2 served on the Hanson in 1966-70. Bill Nolan BT2 served on the Hanson in 1954-55. 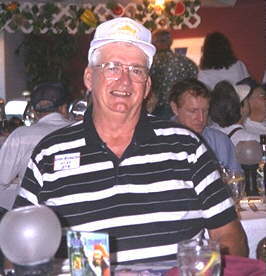 Bill was the force behind establishing the Hanson Reunion and was the head of the 1993 reunion in Las Vegas. We all owe a debt to Bill and those who helped him launch this event. Thank you Bill, et al! 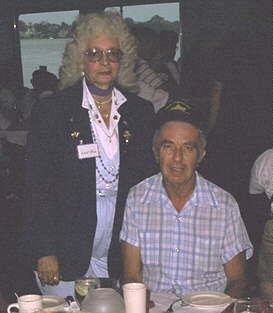 Wally Roe and his wife Betty. 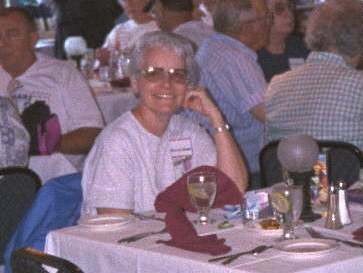 Seated directly behind the Roes is Mrs. Don Shepherd. Behind Betty is Marlena Newman. 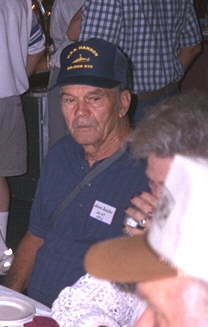 Wally worked in DC and was on board the Hanson 1951-55. George Blair generously offers me his plate! George was a FN on the Hanson, 1970-71. True to his generous spirit, George has made significant photographic contributions to this web site. I publically thank him here for sharing his photos with us. It was great meeting George in person at the reunion!